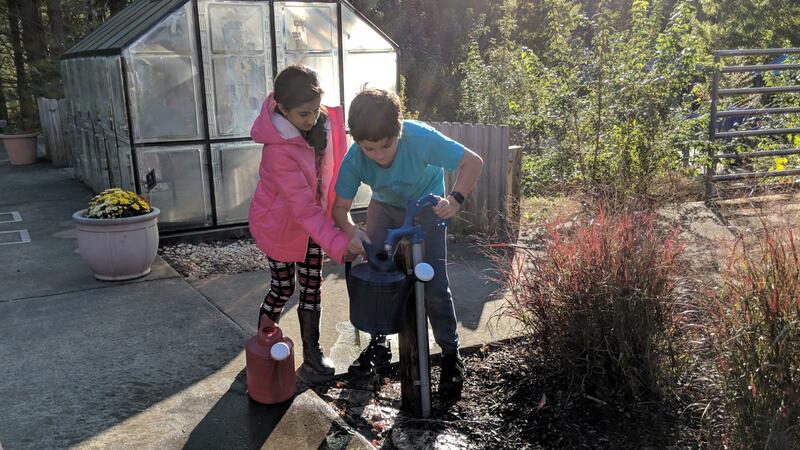 Fifth graders Prabina Adhikari (left) and Noah Townsan collect water from a pump supplied by their school's new rainwater harvesting system. The project was funded by the Environmental Protection Agency as part of a national effort to teach students environmental stewardship. Lisa Philip reports on a project funded by the Environmental Protection Agency as part of a national effort to teach students environmental stewardship. On a recent Wednesday outside Kingswood Elementary School in Cary, a teacher tells onlookers to step back as water comes gushing out of a pump. A couple of fifth graders collect some of it into watering cans. “Y’all can go ahead and water if you want to,” their teacher tells them. The students begin tending to a planting bed filled with native grasses and flowers. The water they use is from a tank at least twice their height. It can hold 2100 gallons of water, all of it collected from the roof of one school building. That rainwater is just a fraction of the runoff that used to run across the playground causing a lot of erosion, said Christy Perrin, sustainable waters and communities coordinator for North Carolina Sea Grant. She has worked to protect the Black Creek Watershed for more than 10 years. That’s the watershed that Kingswood Elementary sits on. Perrin and a team of nonprofits installed the water tank as part of the school’s new rainwater harvesting system and rain garden. Both projects were completed with funding from the Environmental Protection Agency, as part of a national effort to teach students environmental stewardship. “We're helping the creek, we're helping reduce some of that erosion problem they’re having on campus, and then we're offering opportunities for kids to actually get outside and see these things,” Perrin said. 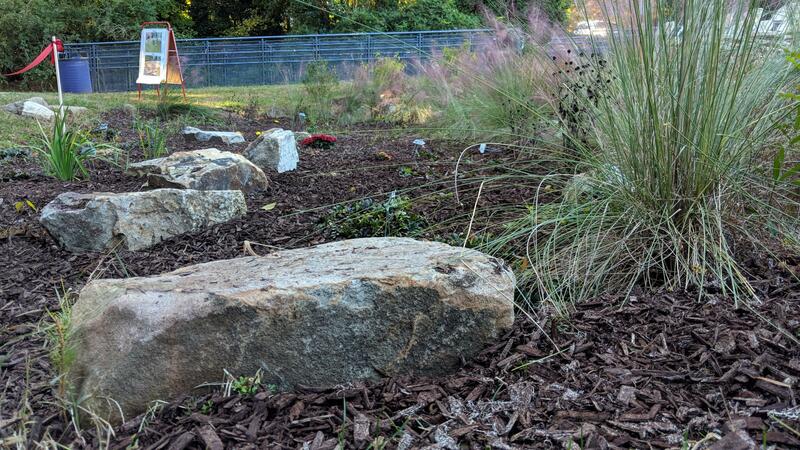 The new rain garden at Kingswood Elementary in Cary contains native plants and helps the local watershed by soaking in rainwater and filtering it before it returns to nearby Black Creek. Perrin said, too often, kids spend the school day indoors. Perrin pointed to the garden behind her. “That's why we have boulders here in the rain garden, so that kids can feel welcome to stand in it and sit around in it and observe it and watch it,” she said. Sherry Schliesser, principal of Kingswood Elementary, said both outdoor projects taught her students how active of a role they can take in protecting their environment. 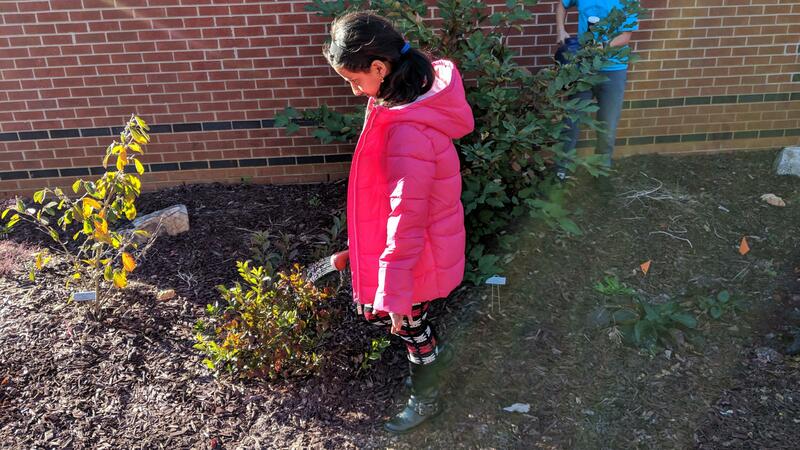 Fifth grader Prabina Adhikari tends to a planting bed using water collected from her school's new rainwater harvesting system. Kingswood Elementary Principal Sherry Schliesser said the new outdoor feature has taught her students about their relationship to local waterways.